MARDAN, Sep 3 (APP): Interior Minister, Chaudry Nisar Ali Khan on Saturday said two intelligence reports were shared with provincial authorities of Khyber Pakhtunkhwa about possible terrorist attack on district court. He said the rectification of any weaknesses in security plan was the responsibility of both federal and provincial governments. He was talking to media persons after addressing the lawyers at Bar Room Mardan here. Earlier, he inquired after the health of the Mardan blast injured. He also condoled with the lawyers over the death of their colleagues in the district courts blast. 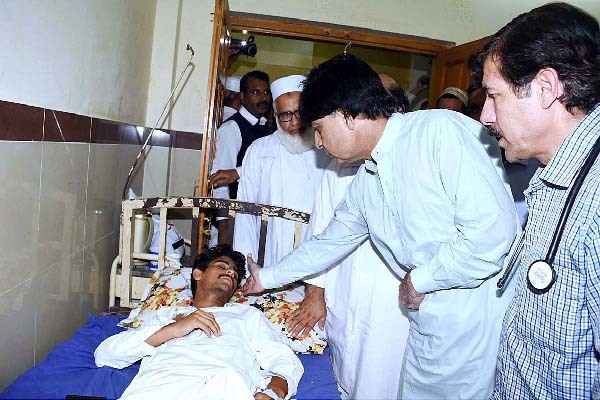 The Interior Minister said comprehensive joint investigations were underway about Mardan Court Blast and Christian Colony attack Warsak to determine identity of culprits, and their facilitators. However, he referred to series of statements by politicians in media, whenever he started discussing weaknesses in the security plan. People compromising national security have no right to stay at the job, he said on a question. He agreed there was no alternative to the human life, adding terrorists had been confined to the dead end due to successful operation by the army, police and FC personnel across the country. He reiterated that war against terrorism was in fact war of survival of country’s future and politicizing the issue would amount to playing with its future. “We should not be divided over the issue of terrorism by pointing finger on each other at this critical juncture,” he added. The people of FATA were the most affected from terrorism as they were left helpless in the past by successive governments, he said, adding present government would not leave them alone. He said menace of terrorism did spread after 9/11 at global level and it also engulfed this country. To a question, he said that the federal government was sharing intelligence reports with the Khyber Pakhtukhwa and Sindh governments to frustrate designs of the terrorists and had been successful in many cases. Nisar Ali Khan said that a comprehensive national policy for looking after the heirs of victims of terrorism would be chalked out in the next cabinet meeting and will be presented before the national assembly for approval. initial reports into the Christian Colony attack had revealed that all four terrorists were of foreign origin who infiltrated into the area from the tribal areas. The investigations were underway to probe the matter of their entry into tribal belt, he added. In his address to the lawyers, the Interior Minister said the lawyer’s community did fight wars for establishment of democracy since the inception of the country. “We have to win this psychological war against terrorism and we need the support of entire nation which we are getting right now,” he added. He praised the bravery of Mardan police in war against terror and added politicking over the terrorism issue amounted to playing with the future of the country.